Japanese are marking another Northern Territory Day with protests, while Russian Foreign Ministry Sergey Lavrov advised them to take current realities into account. ­Representatives of Japan’s radical groups desecrated Russia’s flag in Tokyo on Monday as their countrymen gathered in many places to protest against what they call “Russia’s occupation” of the South Kuril Islands. Japanese Prime Minister Naoto Kan led a rally in the capital and demanded the return of the islands, condemning visits to the Kurils by Russia’s top officials. The rally was attended by 1,500 people. Japanese say the Shimoda Treaty between their country and Russia that was concluded on February 7, 1855, supports their claim. Japanese ultra-nationalist groups rallied near the Russian embassy in Tokyo on Monday, shouting slogans and delivering speeches. 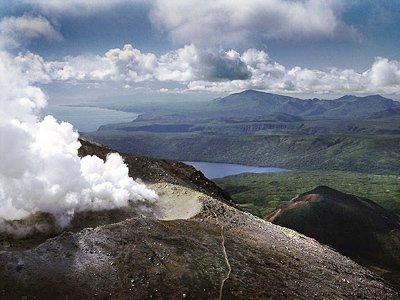 The islands are Russian territory and part of the Sakhalin Region. They were incorporated by the Soviet Union at the end of World War II. Moscow and Tokyo do not have a formal peace treaty because of the territorial dispute. The ambiguity of Tokyo’s position stems from the decisions of the San Francisco Peace Treaty between the Allied Powers and Japan signed in 1951. 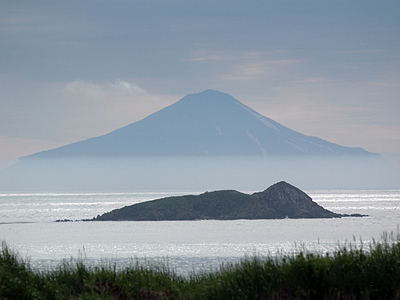 According to the agreements, Tokyo had to give up claims to the Kuril Islands, but it did not recognize the Soviet Union’s sovereignty over them either. Kan criticized President Dmitry Medvedev’s visit to the islands last November, calling it an “unforgivable outrage.” Moscow has immediately reacted, with Russian Foreign Minister Sergey Lavrov saying that Japanese top officials are “stooping to the level ofJapanese radical NGOs,” whose behavior is absolutely unacceptable. The statements made by Japan’s leadership “are clearly not diplomatic,” Lavrov said on Monday. They were in sharp contrast to the positive tone of the meeting between the Russian president and Japan’s prime minister that took place late last year, the minister noted. The Russian Foreign Ministry protested in strong words against “the impermissible comments” of the Japanese administration and Tokyo’s territorial claims. It also demanded that the Japanese government prevent the actions of extremists, defiling the Russian flag. Moscow is “indignant” to the statements made by Japanese high-ranking officials as such comments are “impermissible from the point of view of diplomatic ethics,” the ministry said in a note of protest. It described anti-Russian pronouncement as the result of Tokyo’s official policy. In fact, Japan’s government annually increases the funding of the so-called Movement for the Return of the Northern Territories. And this incitement of anti-Russian views clearly contradicts Tokyo’s calls for partnership with Russia, the ministry stressed. 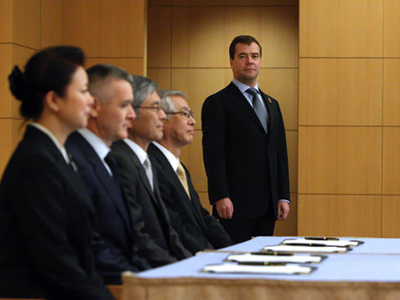 Tokyo has been recently outraged by a series of visits to the islands by Russia’s top officials. 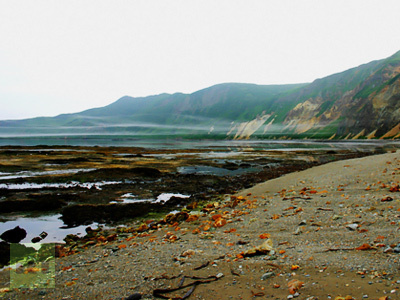 On Friday, Defense Minister Anatoly Serdyukov also visited the Kurils. 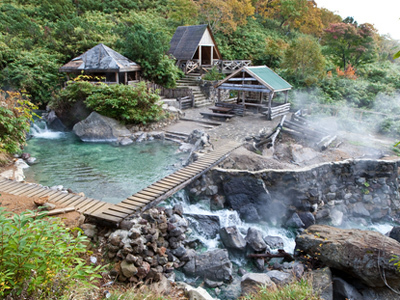 He inspected military facilities on the islands of Iturup and Kunashir, and announced their re-equipment. Earlier Deputy Premier Igor Shuvalov, Deputy Defense Minister Dmitry Bulgakov and Head of Regional Development Viktor Basargin had also visited the islands, prompting Tokyo’s protests. The Russian Foreign Ministry on Saturday called on Tokyo to take “a reasonable and weighty approach” toward territorial realities. 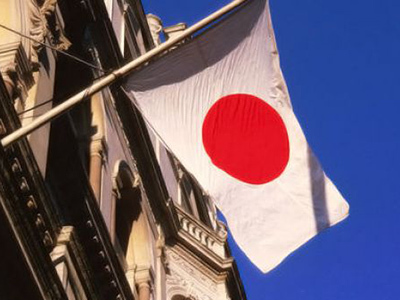 Japan’s refusal to lay emphasis on the “island” issue would facilitate the calm and constructive bilateral dialogue, the ministry said, commenting on Japan’s reaction to Serdyukov’s visit. The Japanese prime minister has stated he does not see any fast solution to the territorial problem and promised “to change tactics.” He had earlier accepted Medvedev’s invitation to visit any Russian region. On Monday, Kan accompanied his criticism with calls for continuing talks with Russia on a peace treaty and economic cooperation.